Coalition of Palestinian Authority organizations warns President Trump against moving the embassy to Jerusalem. The Palestinian National and Islamic Forces, a coalition comprised of representatives of all the organizations operating in the Palestinian Authority including Fatah, Hamas, and the Islamic Jihad, on Saturday warned against President Donald Trump’s planned move of the American embassy in Israel from Tel Aviv to Jerusalem. In a statement, the coalition warned that moving the embassy would "ignite a fire in the region" because Jerusalem is "an occupied city under international law" and such a move would be considered a "full partnership with the open war against our people." 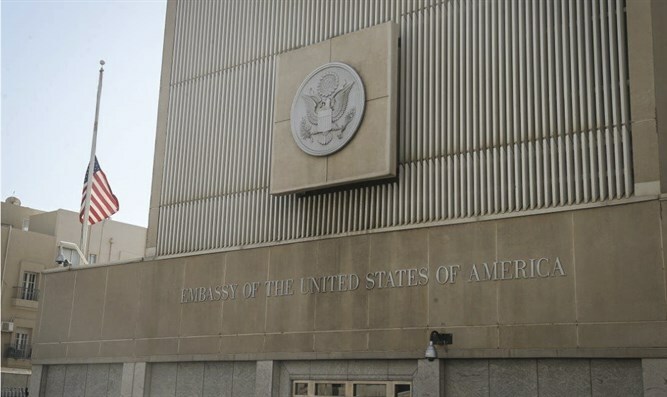 The statement further noted that moving the embassy will "legitimize the annexation, the Judaization and the unilateral steps by the occupation and it will be a mercy killing of any just compromise and agreement, because it would take Jerusalem out of every framework of future negotiations and would impose the unilateral solution. "Moving the embassy, if it takes place, will ignite more fires in the region, where international officials are trying to find arrangements and solutions to different issues, including the Palestinian issue," the statement added. Moving the American embassy from Tel Aviv to Jerusalem and thus recognizing Jerusalem as Israel’s capital was a central campaign promise of Trump’s. The planned move has angered the Palestinian Authority (PA), whose officials want eastern Jerusalem to be the capital of a Palestinian state. PA chairman Mahmoud Abbas on Wednesday promised a “political and diplomatic response” if Trump moves the embassy to Jerusalem. He did not elaborate. Two weeks ago, Abbas wrote Trump a letter in which he warned him against moving the American embassy, saying that such a move would be crossing a "red line" and could jeopardize peace prospects. On Thursday, Abbas received backing from Muslim countries, whose foreign ministers indirectly condemned the planned embassy move when they said they rejected any actions that could undermine the ability of Palestinian Arabs to claim part of Jerusalem in a future state. Meanwhile, MK Avi Dichter (Likud) urged Trump this week not to fear Arab threats and go ahead with the embassy move.